A voter-activated paper ballot counter and vote tabulator. The M100 alerts voters to over-voted races and under-voted ballots. Voters securely cast their vote for each race and/or ballot proposition simply through the touch of the screen. Its Audio Ballot feature assists those voters who are visually impaired. the iVotronic prevents the voter from over-voting and alerts the voter of under-voted races. 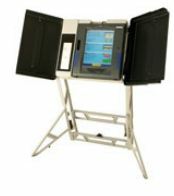 Pulaski County uses iVotronic Touch Screens exclusviely for early voting. If a voter wishes to vote a paper ballot, they must vote on Election Day, or vote Absentee, if they are unable to vote Election Day. Pulaski County is a paper ballot county on Election Day, using the M100 Scanner to tabulate the ballots, with one iVotronic Touch Screen at each polling location for voters with disabilities.